Welcome to TSRI's Summer Grilling Celebration! It has been an amazing few weeks of grilling recipes. But, what is a season of grilling without your own signature BBQ sauce? We keep coming back to use this sauce again. It is amazing! We have used it on the Bacon Bourbon Barbeque Chicken Kabobs and the Lil Texas Barbeque Sliders it is delicious on everything! We use it as a dipping sauce, on ribs, burgers, chicken and so many other ways. 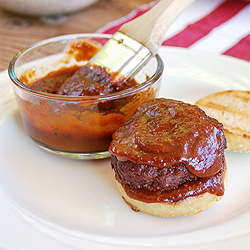 We have an amazing burger coming up in a few weeks that uses this barbecue sauce again. It is our go to sauce. It seems like a daunting task when you look at it. But, it is really simple. It is made in one pan and everything this recipe calls for I keep in my pantry all the time. 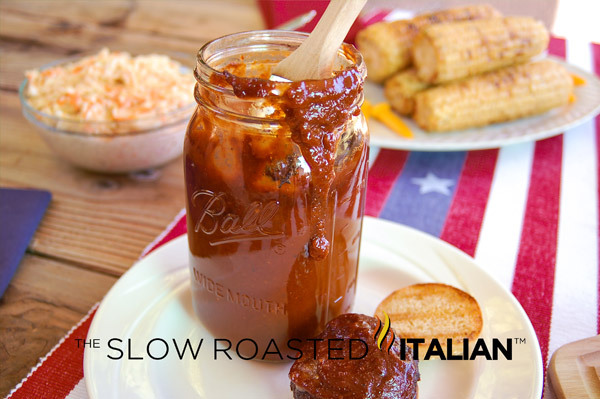 It is a well balanced smoky barbecue sauce with a mouth watering aroma. Its perfectly sweet, with just enough spice to warm your palate. Trust me, once you make this sauce you won't want to buy store bought ever again. Enjoy! Make a double batch and put it in the fridge. I will share more recipes using this sauce really soon. In a large saucepan heat canola oil over medium-high heat. Add onion; cook until soft, about 4-5 minutes. Add garlic and cook for 1 minute. Add ketchup and 2/3 cup water, bring to a boil. Reduce to simmer for 5 minutes. Add the remaining ingredients simmer for 10 minutes, or until thickened, stirring occasionally. Transfer the mixture to a food processor; puree until smooth. Pour into a mason jar; cool to room temperature. oooh, I love the chipotles here. How spicy is it? I love that I can adjust the heat so easily that way. It is just warm. Not spicy really. My mom loved it and she doesn't have a heat tolerance at all. I love making my own barbecue sauce. I have my own recipe but I might have to give this one a try. I love making my own sauces and this one looks great! This looks amazing! Love homemade barbecue sauce! Enjoy your day! How sweet is this sauce, I'm concerned at the amount of sweet flavours going in? Hi Debs, it really is not that sweet. All the sugars and honey are a great balance of flavors. If you are concerned you can cut the sugar a bit by omitting 1/2 the brown sugar and 1/2 the white sugar. But honestly, I have not had anyone mention that they thought it was too sweet. Hope that helps. I am so going to make this. It looks delicious. This recipe sounds so good I bought the ingredients to make it today and realized I bought ancho chile pepper instead of ancho chili powder ( I could not find 'powder'). Can I use the pepper instead of the powder, is there a difference? Also another question...I saw the recipe for Lil Texas spice rub in two different places here and they were printed with the same ingredients except one of them also included 1 TBL. of ancho chili powder...does this also go in the spice rub along with the chipotle and New Mexico chile powders. Am looking forward to trying this recipe along with the beer cheddar cheese sauce. I am so happy you are making these!!! It is pepper (I corrected the recipe). I do vary the Lil Texas spice rub when I use it. It is deliciously smoky with the Ancho, but when I have run out I just omitted it and I had a fabulous rub still. Hope that helps, these recipes are amazing. Let me know what changes you make and how you like them! I'm going to make these today, they sound delicious. Thank you again for the recipes on your blog and for answering my question yesterday. My daughter and I made the BBQ sauce, smokehose burgers and the smoky beer cheddar cheese sauce. All of them were soooo good! Another question though. Can the smoky beer cheddar cheese sauce be frozen? Due to talking, laughing and having fun in the kitchen, while my daughter was making the cheese sauce a couple ingredients were accidently doubled and in the end the whole recipe was doubled three times. That's A LOT of cheese sauce, even for us.